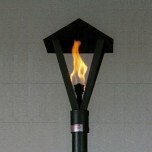 Automated Remote Controlled Lantern Style Tiki Torch. Our 24 Volt remote system allows you to turn on and off your Tiki Torches with a push of a button. Select from many styles. Includes Steel pole and our remote system built into the unit. We are here to assist you in your project.